With an election for the president looming, Americans from coast to coast will be asking each other to state their choice of candidate. Are you a Republican, Democrat, or Independent? Are you a conservative, liberal, or moderate? Do you like candidate A or candidate B, even candidate C or D? Most will happily give an answer hoping to sway the one asking to their stance. Flickr image by DonkeyHotey, some rights reserved. But there’s something new in American politics this year. It goes beyond the choice of party, political flavor, even candidate. The new choice is: Are you anti-establishment or are you willing to continue supporting the establishment’s favorites? Even though most Americans would have a difficult time explaining precisely what the term “establishment” connotes, they have sense of what it means. Suggest that it’s the “old boy network that has been running things for decades” and you’ll likely get an approving nod. Use the words “political elitists” and you’ll readily get a positive response. But is there a definition of the Establishment? A careful selection of a few words that practically all can accept? Has anyone publicly offered a concise explanation of what the increasingly hated term stands for? The word “Establishment” is a general term for the power elite in international finance, business, the professions and government, largely from the northeast, who wield most of the power regardless of who is in the White House. Most people are unaware of this “legitimate Mafia.” Yet the power of the Establishment makes itself felt from the professor who seeks a foundation grant, to the candidate for a cabinet post or State Department job. It affects the nation’s policies in almost every area…. What is the Establishment’s viewpoint? Through the [past four] administrations, its ideology is constant. That the best way to fight Communism is by a One World Socialist state governed by “experts” like themselves. The result has been policies which favor the growth of the superstate…. Substitute “all our enemies, domestic and international” where she mentioned “Communism” 50-plus years ago and you have what many more Americans are beginning to realize. Some would even prefer to leave the word “Communism” in her statement because there is a sense that our country is being made over into a communist-style state. These Americans may be enrolled as Democrat, Republican, or Independent. They may have considered themselves liberal or conservative. But increasingly, vast numbers are fed up with the people who have been in charge, especially those who solemnly promised change and didn’t deliver. They want someone other than entrenched party politicians, Wall Street manipulators, media elites, and left-wing academics. They want an outsider who might really change the way things have been going for decades. In recent years, there have been cries claiming “not a dime’s worth of difference” between Democrats and Republicans. Leading GOP figures have been tagged as a RINO (Republican In Name Only). And some who claim to be conservatives have been labeled Neoconservatives, pushing for more government, even more war. Will the reigning Establishment be supplanted? Not easily. But the kind of change sought by those who recognize its control is sorely needed. Old labels have become somewhat meaningless. New awareness that opposes the Establishment by name is a very healthy development. A Policeman’s Reality: Would You Walk in Their Shoes? Dallas has seen five of its police officers murdered and seven more wounded, along with two civilians. An angry former Army private named Micah Johnson carried out the rampage that was a deliberate attack on police. The motivation for the deadly sniper attack, as stated by the killer himself, amounted to revenge over the recent shootings of black Americans by police in Maryland, Minnesota, and Louisiana. Johnson died when the police employed a robot to attack him three hours after his deadly standoff began. Dallas Police Chief David Brown (photo by Iamhasanansari (Own work) [CC BY-SA 4.0], via Wikimedia Commons. As expected, there have been numerous responses about the incident issued by officials, even by President Obama who attended a memorial service in Dallas for the slain officers. But in the aftermath of the tragedy, Dallas Police Chief David Brown, a black American, issued some truths worthy of consideration by everyone. At a press conference, Chief Brown focused on the real job of policemen, not the many tasks they have been given in recent years. Not enough mental health funding? Let the cops handle it. Not enough drug addiction funding? Let’s give it to the cops. Here in Dallas, we’ve got a loose dog problem. Let’s have the cops chase loose dogs. Schools fail? Give it to the police. Single women are raising seventy percent of the African-American community. Let’s give it to the cops to solve that as well. The Chief suggested that those who are demonstrating and protesting against police in general ought to consider joining the police force. “We’re hiring,” he said, and he promised to send new recruits, once trained, into the neighborhoods to do police work and not be transformed into social workers. Inherent within Chief Brown’s comments is a simple truth: Societal disintegration exists and it needs attention. Not from the policemen who have enough to do in their frequently dangerous work, but from teachers, clergymen, parents, business leaders, and ordinary folks. Micah Johnson’s attack on the Dallas police didn’t solve any of the problems mentioned by Chief Brown. Johnson’s death-dealing rampage may have even added additional problems to the many already present. Especially pertinent is Chief Brown’s pointing to the breakdown of families. Not only in Dallas, but all across our nation, huge numbers of youngsters are being raised in broken families and deficient schools where the values marking a healthy civilization aren’t being taught. When families are broken, those who grow up in what’s left don’t have the benefit of a stable environment. If families were more solid, many of the problems cited by the chief would be diminished if not completely erased. Chief Brown, like police chiefs in other cities who have had to respond similarly to demonstrators in their regions, deserves the thanks of all Americans for pointing to a basic cause of the obvious and widespread deterioration. If America is going to reverse course and see a lessening of civil turmoil and a return to civility, it must start within the family structure. Clergymen, teachers, business leaders, and others along with parents must be encouraged to meet their responsibilities. If they don’t, the already serious deterioration will grow worse – and other Micah Johnsons will arise. Another way to help return to civility is to Support Your Local Police and Keep Them Independent! Find out what you can do to help. It was 15 years ago that sensational attacks by Islamic militants in hijacked commercial airliners crashed into New York’s Twin Towers, the Pentagon, and a field in Pennsylvania. Thousands perished and investigations were launched but many unanswered questions remain. On July 15, Congress finally released the 28 classified pages of the famous 9/11 Commission Report, but will it help those seeking answers? (Image cleanup by Andrew_pmk; straightened and cropped by Holek [Public domain], via Wikimedia Commons). In late June of this year, the New York Times published a front-page article written by two of its reporters about some of those unanswered queries. Specifically, were the 19 hijackers aided in their plot by the Saudi Arabian government? The Times article focused on 28 classified pages from the 2002 congressional findings that have been declared secret and kept from public scrutiny. The 28 pages have recently been brought to light, but what have they shared? What we do know about two of the hijackers, Nawaf al-Hazmi and Khalid al-Mihdhar, is that they arrived in the United States on January 15, 2000. Neither spoke English or had any appreciation of America’s ways. They were taken care of via arrangements seemingly made by Fahad al Thumairy, a Saudi consular official stationed in Los Angeles who also served as an Imam at a mosque where the two men were seen. Another man on the Saudi government’s payroll, Omar al-Bayoumi, arranged for housing and provided for other needs of the two. Bayoumi helped the two hijackers settle in San Diego where the local imam was Anwar al-Awlaki, an American who had become an extreme radical with ties to Al Qaeda. Awlaki eventually fled to Yemen where he became heavily involved as an Al Qaeda recruiter, continually inciting Muslims within the U.S. to engage in Jihad. He was later killed in a drone attack at his base of operations in Yemen. Questioned about Hazmi and Mihdhar, former San Diego-based FBI official Richard Lambert stated, “I have to believe something was planned for the care and nurturing of those guys after they arrived. They needed help getting settled and making preparations [for their deadly hijacking attack].” Thumairy lost his visa after giving unsatisfactory responses to questions about the two men and about his role as an imam. He returned to Saudi Arabia in 2003. And was questioned by American authorities in 2004. Unsurprisingly, Thumairy insisted that his assignment at the Los Angeles consulate had been routine. But he also denied knowing Bayoumi despite the fact that 21 telephone calls between the two over a two-year period had been discovered. After the Times article appeared, 9/11 widow Kristen Breitweiser released further details bearing on the secreted 28 pages and the connections of the hijackers. Working with four other 9/11 widows who are collectively known as the “Jersey Girls,” Breitweiser told of a terrorist summit held in Malaysia in January 2000 attended by Hazmi and Mihdhar and leaders of Al Qaeda from several countries. The leading “Jersey Girl” claims that Bayoumi shared his phone with Hazmi and Mihdhar. She unearthed information showing 32 calls to the Saudi Embassy in Washington, 37 calls to the Saudi Cultural Mission in Washington, and 24 calls to the Saudi Consulate in Los Angeles by “someone” who had used this particular telephone. All of these calls were placed during the first five months of 2000. So questions remain about Saudi Arabia’s connections with some of the hijackers. And, there are many more unanswered questions about the 9/11 attacks and the radical Islamists who conducted them. Will the newly released 28 pages of secreted information provide some answers – even possibly showing that the Saudi Arabian government had a hand in caring for some of the 9/11 hijackers as they plotted their deadly attack? However, cover ups have become a regular feature of the U.S. government’s conduct. In this case, it seems that the beneficiary is the Saudi Arabian government. Why their possible involvement in a sensational crime should be shielded is a question that needs to be answered. Another Turkey Coup Attempt: Will it Affect Us? The nation of Turkey sits in Western Asia. That is, most of it. A small part of Istanbul, the great city in Western Turkey (formerly Constantinople), can be found across the Bosphorus Strait that separates Asia from Europe. This European portion of Turkey (a mere three percent of the nation’s land area) is geographically and even culturally part of Europe. Flag of Turkey (image by David Benbennick (original author) [Public domain], via Wikimedia Commons). A charter member of the United Nations (membership since 1945), Turkey also became a member of the NATO alliance as far back as 1952. A huge U.S. air base sits in the Asian part of the nation. In addition, Turkey has applied for membership in the European Union. Therefore, what happens in Turkey is of great concern to the West, certainly including the United States. Turkey has experienced several coup attempts in recent years (1960, 1971, and 1980). Each failed and each sought to increase the secularization of the nation. The latest attempted coup d’état during July 15-16 failed almost immediately. After a surprising absence in the early hours of the plot, President Recep Tayyip Erdogan emerged and reasserted control. Immediately, the government forces captured several thousand military personnel along with an equal number of judges. Some commentators labeled the coup a failure through ineptitude. But others have speculated that Erdogan engineered the short-lived event in order to centralize and increase his power. Turkey is at least 95 percent Muslim; some claim that the figure should be 99 percent. Without doubt, yearning exists among a small percentage of the people for a more Westernized style of living. But Islam rules, not as strictly as in Saudi Arabia, Iran, and elsewhere, but a dominant force nevertheless. Erdogan himself is a relatively strict follower of Mohammed. Suspicion has arisen that he engineered the plot so it would quickly fail and, while being put down, provide him an opportunity to increase his power and send a message throughout the nation not only that he is solidly in control, but that Islam and many of its controlling strictures would continue to prevail, even grow tighter. Over the years, military forces within Turkey have become a sort of watchdog or guardian of a partial secularization of the nation. Hence, a more committed Muslim such as Erdogan would surely seize any opportunity to water down, even eliminate, such a challenge to Islam’s power. Ergodan’s allies have claimed that Fethullah Gulen, an exiled Turkish cleric living in Pennsylvania, engineered the coup. Gulen immediately denied having any role whatsoever. But Ergodan has asked the U.S. to extradite Gulen to face charges back in Turkey. Is such a request real? Or has it emerged to help cover up Ergodan’s creation of the now-failed plot that will undoubtedly result in an increase in his power and more dominance by Islam. Three years ago in Egypt, the military rose up and, in a lightning coup d’état, deposed elected president Mohammed Morsi, a strict follower of Islam. That country went from rule by increasingly dominant Islamists to a more westernized secularism under the generals. Turkey seems to have undergone exactly the opposite transition as a result of the recent coup attempt. How Erdogan deals with the judges and military personnel he has in custody will indicate how deeply Islam will rule in the future. Meanwhile, ISIS in next-door Syria and Iraq looks northward to Turkey to see if help in achieving its draconian goals will be forthcoming from its nearest neighbor. Each new report about killings committed by a person wielding a gun brings new cries for restricting, even canceling, the right of the people to keep and bear arms. After the mass killing in Orlando, Florida, dozens of U.S. congressmen swarmed into the House chamber and staged a unique sit-in demonstration as they demanded passage of new laws. But their demands focused on making more difficult the plight of a law-abiding citizen to possess a weapon. Representative Louie Gohmert (R-Texas) trying to convince demonstrators to use logic after the mass killing in Orlando, Florida (Flickr photo by Gage Skidmore, some rights reserved). In the midst of their boisterous and truly childish demonstration, several produced photos of the 49 victims of the rampage. 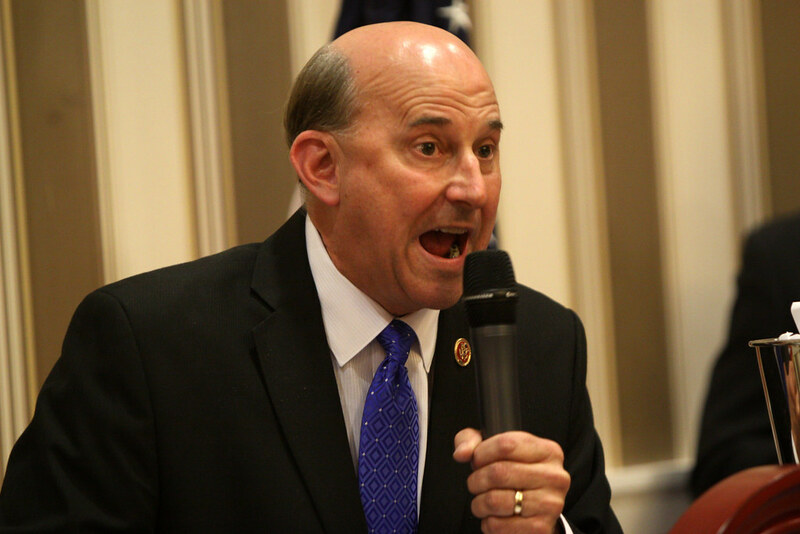 Representative Louie Gohmert (R-Texas) confronted the demonstrators with a dose of pure logic. Above the self-serving din emanating from the anti-gun legislators, he insisted, “Radical Islam killed these poor people.” Had he an opportunity to add to his statement, he surely would have told the sit-in crowd that the guns used in Orlando massacre didn’t take themselves to the scene of the crime. Nor did those guns pull their own triggers and fire bullets into the 49 victims. Gohmert was urging the use of logic. But he failed completely and the sit-in continued. The anti-gun demonstrators weren’t interested in logic. On September 11, 2001, hijacked commercial airliners slammed into New York’s Twin Towers. Close to three thousand died in the worst terrorist attack ever committed on American soil. Most of the victims of that sensational crime died because the buildings collapsed crushing the occupants. No guns were used to kill those innocent people. The weapons were two airplanes. Without doubt, this was a unique criminal act. If crusaders within the anti-gun campaign movement followed their illogical campaigning, they would have called for banning the use of airplanes. But no such demand was ever voiced. The horrible deed was caused by people who guided those planes into the two buildings. Just as the guns used in Orlando, San Bernardino, Fort Hood and other crime scenes didn’t take themselves to the locales where they were used, select the targets, and pull the triggers, those guns were activated by people. And the airplanes that brought down the Twin Towers were also guided by people. The king of logic employed by Congressman Gohmert after the Orlando shooting didn’t escape the minds of gun grabbers in the wake of the tragedy in New York. They were willing to blame persons then, but not when a terrorist uses a gun to kill his victims. At the bottom of outpourings of many would-be gun grabbers, hypocrisy reigns and logic is absent. But the right to keep and bear arms remains. Let’s keep it that way. Shame on FBI Director James Comey! He supplied numerous reasons why Hillary Clinton’s reckless handling of her emails should have led to a recommendation that she be indicted. But, in parlance that has become common, the head of the FBI punted. Clinton magic, enjoyed repeatedly in the past by husband Bill, seems to have prevailed once more. Comey revealed that Mrs. Clinton had improperly used “several different servers and administrators.” But she has repeatedly admitted to using only one such instrument, even joked about employing a type of email that erases itself shortly after being sent. Comey pointed to 110 Clinton emails that contained varying degrees of classification, even some as high as top secret. But she claimed on numerous occasions that anything marked classified or top secret had been so marked after being sent by her, a complete fabrication. Comey said “any reasonable person” in the Secretary of State post should have known not to send or receive sensitive information on an unsecured personal computer. And he stated his opinion that “hostile actors gained access” to what she was sending and receiving. It is hardly a stretch to claim that the head of the FBI has in fact questioned her ability to reason. With all of this, and more, Comey still recommended against an indictment. If she’s not guilty of any crime and not liable for prosecution, what’s left? Shouldn’t Comey have concluded that she’s not a reasonable person, not incompetent, and not worthy of being our nation’s president? Instead, he left open a path for her to win the White House. The known facts indicate she broke laws, repeatedly denied any wrongdoing, endangered fellow Americans, destroyed government records, and lied to the American people and government investigators. Question: If elected to be our nation’s president, should she be given a security clearance? If the answer to that question is either “No” or “Possibly No,” she should quit the race for President. In the wake of the British vote to leave the European Union, Prime Minister Robert Fico of Slovakia took over as President of the European Council. Starting July 1, he will hold that rotating post for six months, followed by another head of state from one of the remaining 27 EU member countries. Prime Minister Robert Fico of Slovakia took over as President of the European Council (image by MGlen (Own work) [CC BY-SA 3.0], via Wikimedia Commons). Fico has always been an ambitious politician. In the 1980’s when his country (then part of Czechoslovakia) was under Communist rule, he joined the Communist Party. After the so-called “Velvet Revolution” and the end of formal Communist rule, and before Slovakia and the Czech Republic split, he left the Communist Party and won election to the Czechoslovakian parliament in 1992. When Slovakia became independent, he wrangled with fellow political leaders, suffered several setbacks, and eventually formed his own political party that saw him win election as Prime Minister in 2006. After a brief period out of office, voters returned him to the nation’s top spot in 2012. Cheered by the Brexit result and an outspoken foe of forced immigration into his country, Fico has stated, “Islam has no place in Slovakia; they change the character of a country.” He has pointed disdainfully to German Chancellor Angela Merkel’s willingness to accept roughly one million refugees, many Muslims among them. He is well aware of the ruckus raised as a result of this influx into Germany by an angry German population. Everywhere in Europe, the Brexit result spurred an increase in outspoken objections to immigration. Fico certainly knows this and is responding to that attitude, exactly as should be expected of an ambitious politician. Just prior to Britain’s move to quit the EU, he notified EU heads of state that the Council’s customary “informal” gathering at which he will preside will convene in Bratislava in September, not in Brussels where it usually convenes. The leader of Britain will not be invited to attend. At the September EU Council meeting, the leaders of the remaining 27 EU states will discuss attempts to diminish the clout of the European Commission, a more powerful body than the EU Council, where decisions increasingly rile member nations. “Brexit brings a new dynamic,” said a Slovak official, an attitude quickly spreading throughout Europe after the shock wave from Britain. Fico himself has stated, “Crucial decisions in the future of Europe cannot be decided by a small group of member states,” a reference to EU decision-making by the six founding countries. The key matters contributing to the British anti-EU stance – forced immigration, dictation from Brussels, and national independence – are felt all over Europe. They will surely be on the agenda at the Bratislava meeting. Robert Fico’s handling of the conference, and the attitude of other leaders in attendance, will reveal whether the future will bring a crumbling of the EU, or a salvaging of the pact despite the damage inflicted by British voters.